After having been in the UK for almost half a year, our Italian coordinator Lara recently went on a short break to our Flavours’ cooking and Pilates destination in Tuscany. 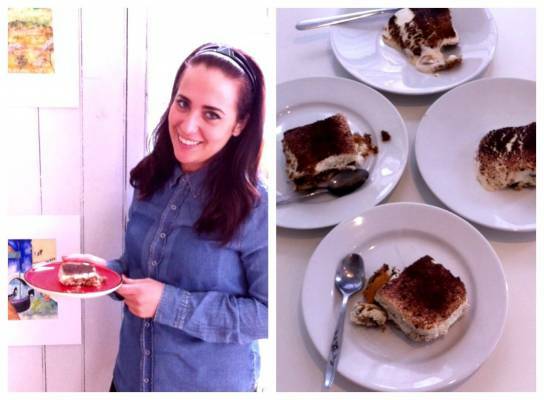 Coming back to the British island, we thought this was the perfect time to interview her about Italian food & culture. Here is what she told us! Where do you get your favourite home-made Italian food? First of all, I need to say that I really miss my Italian food. Food in Italy is something that represents our culture. You cannot compare it to any other culture. I mean, I don’t think that there are many other societies where food is such an important “backbone” as in Italy. However, what I also have to say is that the world is becoming more and more to a global village and it means that you can easily find what you want anywhere. You just go to a supermarket and buy all the ingredients you need (and, more or less, you can find almost everything). So my favourite “restaurant” is actually my place: I really love to prepare food on my own and eat it at home. Unfortunately, cooking takes a lot of time. Especially some things request a long time to be prepared and cooked, like pizza. That’s definitely my favourite Italian food. I’ve tried many so-called Italian restaurants where, unfortunately, I found very little of Italy. But today I want to suggest the ones that are my favourites. Those where you can find a real Italian pizza! If you live in Edinburgh, you definitely need to try the pizza in Il Castello: Besides having one of the greatest pizzas in Scotland, it’s also situated in a lovely location, just next to Edinburgh castle. If you live in London or you have the chance to get there, you should go to Notting Hill at Pizza Metro Pizza: I thought the main reason for this area’s popularity was the movie whereas now I primarily associate this wonderful neighbourhood with one of the best pizzas I’ve ever tried! As cooking is so important to you: Do you have a personal cooking secret you would like to share with us? I’ve always thought that British people or foreign people who want to cook Italian food try to mix too many ingredients to prepare a dish. You always need to remember that Italian cuisine is good as much as simple – let’s say that we prefer quality… instead of quantity and variety! What is the first thing you eat when you go home to Italy? When I go back to Italy, my family prepares a really big Italian lunch (or dinner). Usually, the main dish is lasagne but they always prepare many other things (ravioli, pork roast, tiramisu…). You can get nearly everything here in the UK. The thing that supermarkets really don’t have and I miss a lot is diced brewer’s yeast (the most suitable to prepare pizza). However, if you live in Edinburgh you can get it at Valvona&Crolla. So, what are the main differences between Italian and British eating culture? I do believe that the main differences between Italian and British eating culture does not come down to the things we eat but the way we eat. The thing that shocked me the first time I entered a supermarket was the massive presence of ready-to-go food. Here, you can find whatever type of meal already in a box, prepared. There’s even a dedicated part for these foods in the fridge: Unbelievable in the eyes of an Italian! I mean, we do have ready-to-go food as well, but no Italian person would think about eating it if not in a case of emergency. Another thing that really shocked me was the dinner time: at best 6 pm. Basically our snack time. But, all in all British and Italian eating cultures are closer than we think: you just need to swap tea with coffee. Is there a special Italian word that does not exist in English language? The word I can’t find a translation for is “merenda” (the meal between breakfast and lunch and lunch and dinner). I know that I can use “snack” but it doesn’t have the same meaning in Italian. We use the world snack (spuntino) but we really consider it as something really quick, whereas the merenda is something more… important, especially for children. Do you have a favourite food related Italian word? And finally, is there something you love about the British kitchen? I really like shortbread biscuits and the fact that in the UK they have many kinds of tea that you cannot easily find in Italy. Also, I really appreciate the hamburgers they have, much better than the Italian ones.